ESSAY: Personal essay, labeled ESSAY, any topic. Max 5 double-spaced pages. FICTION: Short story, labeled FICTION. Max 5 double-spaced pages. POETRY: One poem. Max 50 lines. Entries must be typed. Stories and essays must be double-spaced. Please give your story, essay and or poem a title. Entries cannot be returned. Winners will be announced by May 2018. Include a self-addressed stamped envelope if you wish to receive a list of winners. GOOD LUCK! Deadlines: Find your state here. Submit: Personal essay in the form of a letter to an author, living or dead. See guidelines. The 2017-18 Letters About Literature contest for young readers is made possible by a generous grant from the Dollar General Literacy Foundation, with additional support from gifts to the Center for the Book in the Library of Congress, which promotes the contest through its affiliate Centers for the Book, state libraries and other organizations. Guidelines: Simultaneous and previously published submissions acceptable if stated in cover letter. See details. Gregory Djanikian was born in Alexandria, Egypt, and came to the United States when he was eight years old. He has published six poetry collections, the latest of which is Dear Gravity (CMU Press, 2014). His poetry appears in American Poetry Review, Best American Poetry, Boulevard, Poetry, Southern Review, and TriQuarterly, among others. Until retiring, he was the longstanding Director of Creative Writing at the University of Pennsylvania, where he still teaches poetry workshops. Greg’s insight and instruction has greatly enriched both the Adroit Journal as well as its staff of emerging writers. We’d like to recognize and encourage the gift of such support by offering it ourselves, to six writers in need of affirmation and support. In honor of Greg’s contribution to emerging student and non-student writers at Penn and around the world, we hope to recognize talent from around the world and open them to a long future in writing. We will be annually recognizing six emerging student or non-student poets as Gregory Djanikian Scholars. All emerging writers who have not published full-length collections are eligible (regardless of age, geographic location, or educational status), and are encouraged to submit. Gregory Djanikian Scholars receive $100 and publication of their portfolios of poems in a future issue of the Adroit Journal. Finalists will be awarded copies of Greg’s latest collection, Dear Gravity, and a list of semifinalists determined by the editors will be released with results. Submissions may include up to six poems (maximum of ten pages single-spaced). Simultaneous submissions, previously published submissions, and submissions recognized by outside organizations are accepted, provided that a) a full catalogue of publication history for enclosed poems is included in the submission and b) at least one poem in the submission remains unpublished. Submitters should reach out promptly via email (editors@theadroitjournal.org) if work acknowledged as unpublished in the cover letter is accepted elsewhere. Writers are welcome to additionally submit enclosed work to the Adroit Prizes as well as through our general submission portal. However, each writer may not send more than one entry per year for the Gregory Djanikian Scholars designation. 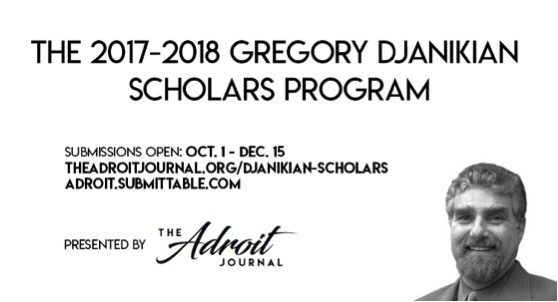 As mentioned above, all emerging writers who have not published full-length collections are eligible (regardless of age, geographic location, or educational status), and Gregory Djanikian Scholars will receive $100 and publication in a future issue of the Adroit Journal. Additionally, finalists will be awarded copies of Greg’s latest collection, Dear Gravity, and a list of semifinalists determined by the editors will be released with results. To accommodate this while offering free online issues, we have set a non-refundable submission fee of $9. If you require financial assistance, you may submit a fee waiver by downloading this form and following the instructions. Due to fee waivers’ processing time, fee waivers will only be accepted until one week before the deadline (postmarked). Please direct any questions to editors@theadroitjournal.org. A special performance of their work read by professional actors. Students must submit two pieces of fiction. • Entry into the National Regional Contest, the winner of which receives a “book deal,” an anthology of their work. • A special performance of the New Jersey Youth Poet Laureate winners. • Additional opportunities to perform throughout the year as ambassadors of the NJ Youth Poet Laureate Program. • Works of poetry, rap, and spoken word. • 5 poems, including a poem on the theme: “Mind Your Elders,” about senior citizens. Awards: 1st Prize: $500; 2nd Prize: $250; 3rd Prize: $100. The contest recognizes outstanding work by student writers in the 11th grade. 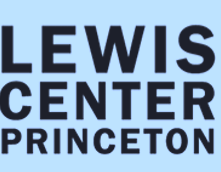 The jury consists of members of the Princeton University Creative Writing faculty such as Michael Dickman, Yiyun Li, Paul Muldoon, James Richardson, Tracy K. Smith, Susan Wheeler, and Monica Youn. Find guidelines here. Online submissions are now being accepted for the 2018 contest — apply below. The application deadline is midnight EST on Monday, November 27, 2017. Thank you for your interest in the Leonard L. Milberg ’53 High School Poetry Prize. While we encourage the inclusion of poetry in the high school English curriculum, we ask you to please refrain from using the contest as an occasion to require all your students to submit a poem as a homework assignment. 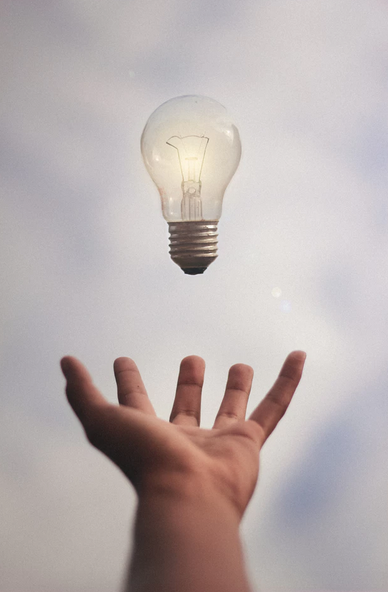 If you read the poems from the past student winners, you’ll see that they all carry a sense of urgency and necessity that is difficult to conjure when a student is obliged to submit a poem. Ideally, we hope motivated students will choose to enter the contest, and that they’ll come to see the writing and sharing of their poems as a joy rather than an obligation. 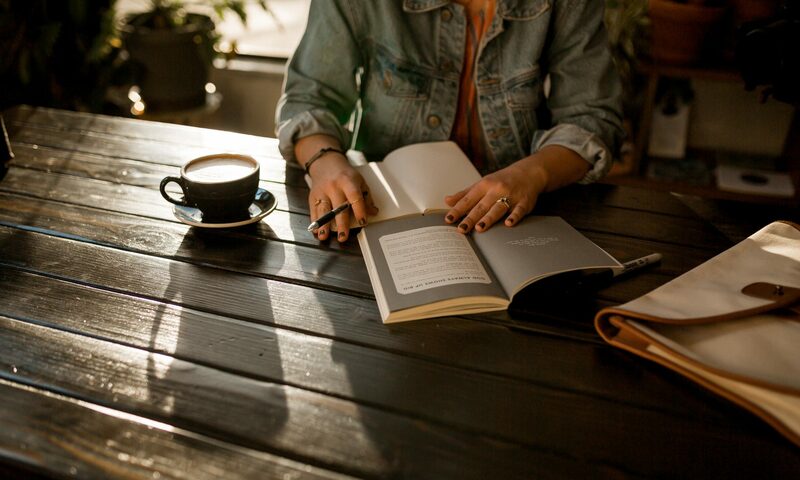 The Patricia Grodd Poetry Prize for Young Writers recognizes outstanding young poets and is open to high school sophomores and juniors throughout the world. The contest winner receives a full scholarship to the Kenyon Review Young Writers workshop. In addition, the winning poem and the poems of the two runners-up will be published in The Kenyon Review, one of the country’s most widely read literary magazines. The contest is named in honor of Patricia Grodd in recognition of her generous support of The Kenyon Review and its programs, as well as her passionate commitment to education and deep love for poetry. The final judge of the contest is KR Editor at Large Natalie Shapero.